Here's an overview of how JAHA has developed into one of the most dynamic heritage associations in the state. The Johnstown Area Heritage Association (JAHA) is founded as the Johnstown Flood Museum Association, with the foremost mission of preserving and interpreting the story of the 1889 flood. The organization opens the Johnstown Flood Museum in the former Cambria (Carnegie) Library building. JAHA achieves its long-range goal of presenting a high quality visitor experience on the theme of the Johnstown Flood when it reopens the Johnstown Flood Museum following a $4 million capital investment that includes restoration and renovation of its building, and installation of a new permanent exhibition and a new film. 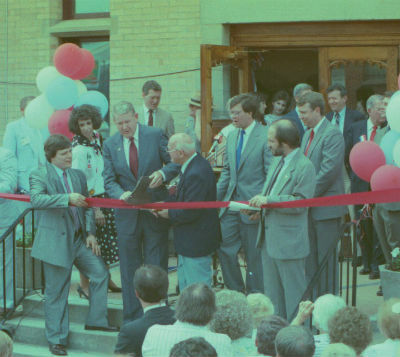 In the photo at right, Rep. Jack Murtha (center left, with dark red tie) cuts the ribbon as Richard Burkert, JAHA president then and now, looks on (front row, far right, holding ribbon). The museum’s film on the Johnstown Flood wins the 1989 Academy Award for Best Documentary Short Subject. JAHA takes a leadership role in helping present a year-long community commemoration of the centennial of the Johnstown flood. The Johnstown Area Heritage Association expands the scope of its programs and collections to include the themes of iron and steel making, immigration and ethnicity. JAHA successfully recruits the National Folk Festival to Johnstown in cooperation with state and city officials, and raises the money necessary to bring the festival here for a three-year run. 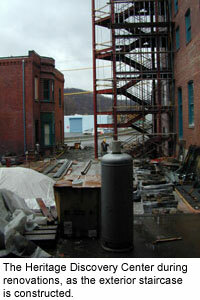 JAHA completes its Johnstown Heritage Development Plan, which focused the organization’s efforts on preserving and interpreting the Cambria City and Downtown Johnstown neighborhoods, calling for the development of the a Heritage Discovery Center, a “festival park,” and local historic preservation district guidelines. JAHA researches and successfully nominates six historic districts in Johnstown (Downtown, Cambria City, Moxham, Westmont, Minersville and Old Conemaugh Borough) to the National Register of Historic Places. JAHA acquires the former Morris Paper Warehouse (which was built as the Germania Brewery) for re-use as the Heritage Discovery Center. The National Folk Festival moves to another city, and JAHA begins to produce a festival on its own as the AmeriServ Johnstown FolkFest. JAHA opens the first phase of the Frank & Sylvia Pasquerilla Heritage Discovery Center, featuring an interactive permanent exhibition that places the visitor in the role of an immigrant to Johnstown around the turn of the century. With the help of State Sen. John Wozniak, JAHA obtains a grant for directional signage to help tourists and locals locate museums, garages, hospitals and other public buildings in Johnstown. More than 70 signs are installed. Major efforts begin to conserve the 1864 Blacksmith Shop, which is owned by the Johnstown Redevelopment Authority and is one of the most important remaining buildings in the Cambria Iron & Steel National Historic Landmark. JAHA obtains much of the grant funding for this preservation, which includes restoring the cupola, repairing the brick walls using historically accurate methods, and replacement of doors and windows. The work continues through 2007. JAHA opens the Wagner-Ritter House and Garden, a Cambria City steelworker’s residence that was inhabited by three generations of the same family from the 1860s through the 1990s. 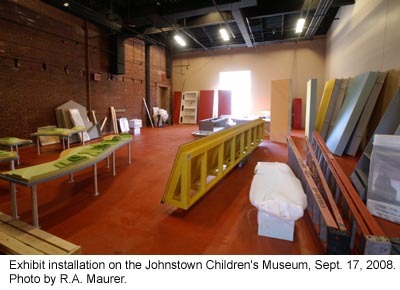 Raising funds through a capital campaign entitled “Preserving Our Heritage: Revitalizing Our Community,”JAHA begins the second phase of renovations on the Heritage Discovery Center, which will include the Johnstown Children’s Museum. Groundbreaking takes place in November, and construction continues through 2008 and the first half of 2009. 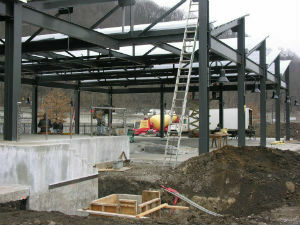 In June, the Johnstown Children’s Museum opens, and the “Mystery of Steel” film presentation premieres in the HDC’s Iron & Steel Gallery. JAHA renames the FolkFest the Flood City Music Festival to better reflect the type of music offered. The first phase of the Johnstown Flood Museum renovation is completed, including digitization and captioning of the Academy Award-winning documentary and refurbishment of the theatre in which it is shown (including new projection and sound equipment, new seat upholstery and new carpet). The Johnstown Train Station is donated to JAHA by by Carole Furst Gigilotti and Harvey and Katherine Supowitz. 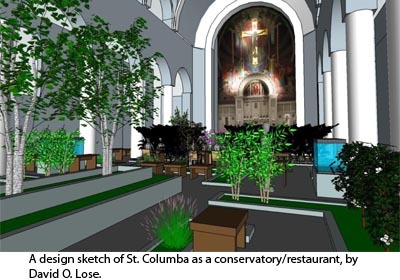 JAHA plays a lead role in the effort to conserve four historically and architecturally significant ethnic churches in the Cambria City neighborhood in Johnstown that were closed by the diocese. In November, a design charrette is held with more than 100 Johnstown residents in attendance, and several architects and design professionals develop conceptual plans for how these structures might be reused. 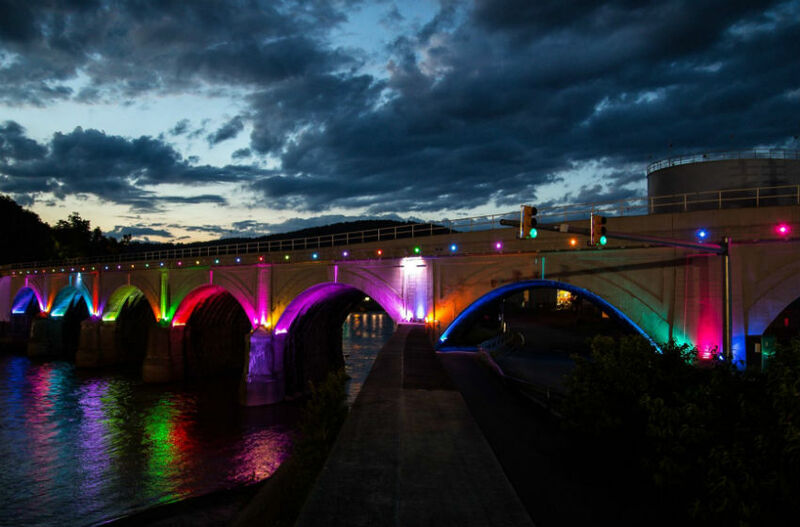 With the help of a community committee, the Stone Bridge Lighting Project is completed. Dedication (shown in this photo by Phil Balko) occurs in September. With help from Concurrent Technologies Corp., JAHA successfully conserves Morley’s Dog, a City-owned statue that is a beloved icon of the 1889 flood. Construction begins on Peoples Natural Gas Park downtown (as seen in this photo) and continues through the first half of 2012. In October, JAHA assists with another design charrette for the Cambria City churches, building on the work started in 2010. These efforts help facilitate the successful transfer of the ownership of the four churches from the diocese to 1901 Church, Inc., a non-profit organization, which takes over the effort to re-use and preserve them. Peoples Natural Gas Park is dedicated in June, and is used all summer long for concerts, Thunder in the Valley, the Flood City Music Festival and other existing events. 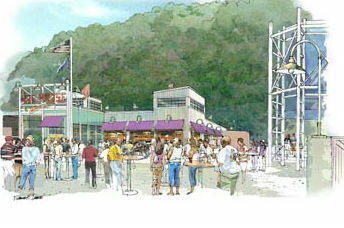 Over the following years, new events begin to take place in the space, including Brews & Blues in the Valley, summer concerts presented by various organizations (including the Johnstown Free Medical Clinic, JAHA, Community Foundation for the Alleghenies), Path of the Flood Historic Races, Ice FunFest, FroggyQ Country Music & BBQ Festival, and others. The park is also used for private events, such as weddings, picnics and receptions. In cooperation with other community groups, JAHA plans an event to mark the 125th anniversary of the Johnstown Flood. 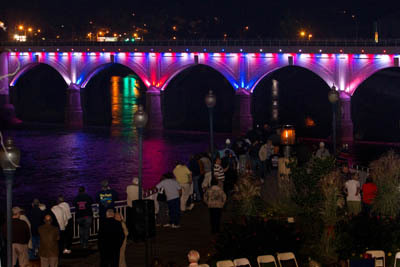 Highlights include the presentation of a requiem, a commemoration ceremony at the moment the flood struck Johnstown featuring Michael Novak as the keynote speaker, the National Park Service’s luminaria at the Johnstown Flood National Memorial, a Community Day at Peoples Natural Gas Park, and the Path of the Flood Historic Races. Originally intended to be a one-time event, the races proved to be so popular that they are now held annually. 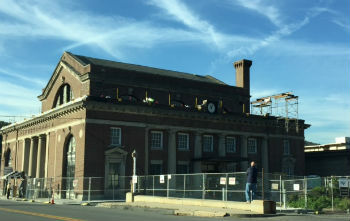 JAHA raises funds to begin major renovations of the Johnstown Train Station, including a new roof (as seen in this October 2016 photo). Concurrent work being completed by Amtrak to bring the station into ADA compliance complements these efforts. In September, a naming ceremony is held for the Community Foundation Oilhouse at Peoples Natural Gas Park in recognition of the support the Community Foundation for the Alleghenies provided for the development of the park. The Center for Metal Arts moves from 70 miles northwest of New York City to Johnstown’s Blacksmith Shop, a move that was set in motion when the Center’s leadership saw a photo of the building posted on JAHA’s social media. The Blacksmith Shop is the most historically significant building left in the Cambria Iron & Steel National Historic Landmark and is owned by the Johnstown Redevelopment Authority. 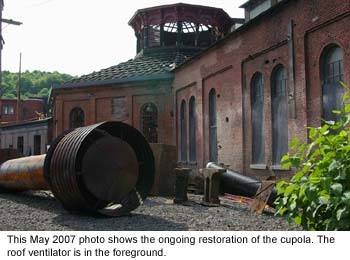 The building was saved in 2006-2007 when JAHA and the JRA obtained significant grant funding to preserve and restore it. Further refurbishment of the Johnstown Flood Museum. Currently, a $3.45 million campaign is ongoing to renovate and refurbish Johnstown’s flagship tourist attraction, and provide marketing support.